The Force was strong with Rogue One at Celebration London, beginning with the moment attendees received their badges for the weekend. Two badges contained art of characters exclusive to the next installment due out in December. 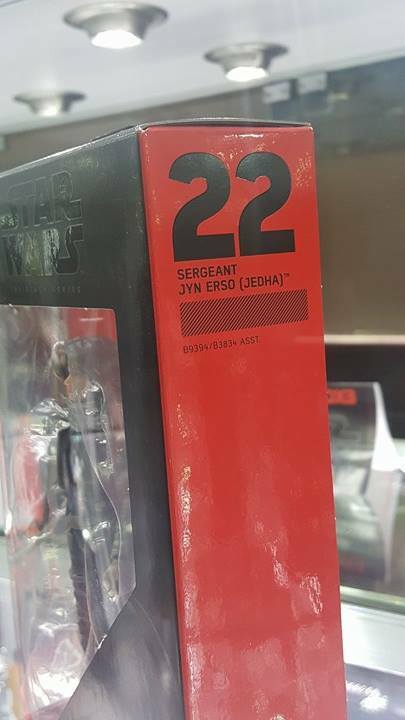 Jyn Erso and a Death Trooper were depicted on the adult 3-day badge as well as the special guest badge respectively. On the first day of the show (Friday), fans flocked into the Celebration Stage for the Rogue One panel in the hopes of finding out more information about this unique anthology film. Warwick Davis had been advertised as host of all the panels on the Celebration Stage, but this time, however, Lucasfilm had a surprise for us. Gwendoline Christie (Captain Phasma in The Force Awakens) was announced as the host and the entire auditorium erupted with joy. One by one Gwendoline introduced guests to the stage to discuss Rogue One. Kathleen Kennedy (President of Lucasfilm), Gareth Edwards (Director of Rogue One), Kiri Hart (Head of Lucasfilm Story Group), John Knoll (Executive Producer), Diego Luna (Captain Cassian Andor), Riz Ahmed (Bodhi Rook), Felicity Jones (Jyn Erso), Donnie Yen (Chirrut Imwe), Jiang Wen (Baze Malbus), Alan Tudyk (K-2SO), Mads Mikkelsen (Galen Erso), and Forest Whitaker (Saw Gerrera) were welcomed by cheers from the audience. Ben Mendelsohn (Director Orson Krennic) even showed up in costume flanked by four Imperial Death Troopers! Once everyone was introduced on stage, Gareth Edwards released a behind the scenes clip as well as the new teaser poster for the film for everyone to enjoy. Every fan in the panel room received a poster at the conclusion of the panel. Gwendoline Christie continued to have surprises up her sleeve as she revealed an action figure of Jyn Erso and presented it to Felicity Jones. This was the first action figure of Rogue One that had been revealed. Hasbro's booth had this figure on display for fans to enjoy during the convention. For the lucky fans that were in the Celebration Stage auditorium, a short teaser trailer with additional content was shown at the end of the panel. No phones or cameras were allowed during this time. The Rogue One content wasn't finish yet...On the second day of the show (Saturday), during the creatures panel, a creature from Rogue One came out on stage. He can be seen in the sizzle reel above and was previously only known as "space monkey". Since Celebration London, it was revealed by Pablo Hidalgo (creative executive at Lucasfilm) that this character's name is "Bistan" and he's a member of the Iakaru species. Costumes and props of Rogue One had their own special area within the convention center. In the South Hall, an exhibition with it's own queue attracted fans throughout the entire weekend. For an in depth look at the costumes, click here. Within the costume exhibit, glass cases containing models of the Death Star, Krennic's shuttle, a TIE Striker and a AT-ACT (All-Terrain Armored Cargo Transport) were popular attractions.